The property includes a main renovated house (145m2) with 2 spacious bedrooms, kitchen, living room and outdoor deck facing the gardens (2500m2) and pool. There is a separate second newly built large bungalow with 2 bedrooms and a third smaller individual bungalow with 1 bedroom. (45 m2 & 20 m2). Foot paths lead to the centrally located swimming pool where there is also a ranch with stove and barbecue area. 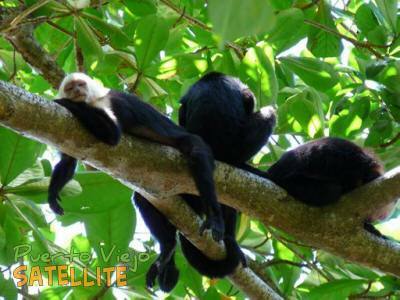 Located just 400 meters from the entrance of Cahuita National Park.